Mrs Margaret Dell shows Mr Terry Kelly, a radio operator at Awarua Radio, a glass insulator which formed part of the 400ft mast at the station until it was felled in 1938. Mrs Dell was at the station yesterday, along with Mr Nicholas Windle (left) and Mr George Jenkinson, as part of the preparations for the station’s 75th jubilee in December. Private Nicholas Windle, on guard at the gate of Awarua Radio during World War II, was confronted by the enemy. It was a short argument. Private Windle aimed and fired. The enemy fell, dead. Forty-five years later, he admits it was not a Japanese soldier he killed. Decoration did not come Private Windle’s way. The guards had to account for every bullet fired, and the Army hierarchy was reluctant to accept his pest destruction methods as a reasonable excuse for expending ammunition. However, Private Windle stuck to his guns. He didn’t like rats, he didn’t know how many others might be behind the huge one confronting him, and as far as he was concerned, he was doing his wartime duty – shooting the enemy. 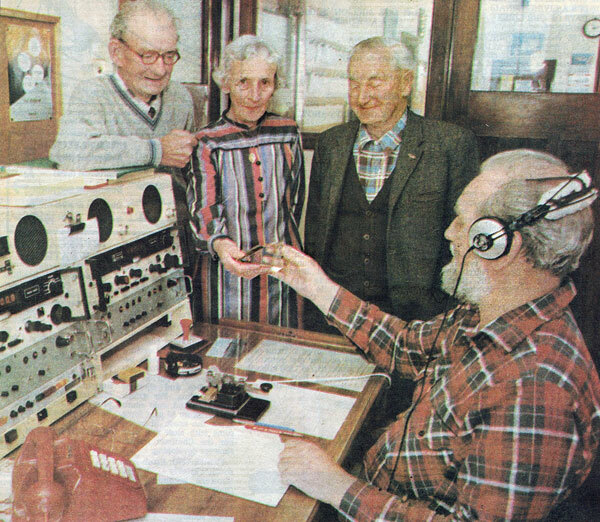 Mr Windle was reminiscing yesterday on earlier days at Awarua Radio with Mr George Jenkinson, also a private on guard duty during the war years, and Mrs Margaret Dell, who spent her childhood at the radio station when her father, Charles Rillstone, was an engineer there. They were at Awarua as guests of the station manager, Mr Lester Price, who is organizing the station’s 75th jubilee, to be held on December 2 and 4. The trio are helping Mr Price piece together Awarua Radio’s history and assist in finding former employees. Privates Windle and Jenkinson were having plenty of chuckles about the “old days” yesterday. Mr Jenkinson recalled the time when the Home Guard, which was stationed at Omaui, raided the Awarua Radio’s cookhouse. Army headquarters was not impressed with that. Nor was the Drill Hall man from Invercargill who travelled down to the radio station, but could not remember the password for entry. No-nonsense Private Windle didn’t let him in. The Drill Hall man protested. Private Windle pulled back the bolt on his rifle. The Drill Hall man fled. Mrs Dell was not outdone on the story-telling front yesterday. 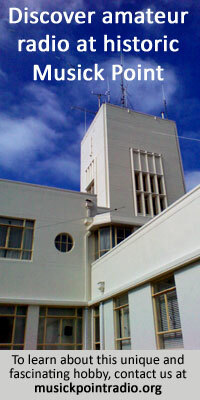 She spent the first eight years of her life at the radio station, before her father transferred into Invercargill in 1924. She can recall being forbidden to enter the radio area but would sneak in and add her own dots and dashes to the Morse code taken by the radio operator, when he wasn’t looking. “Then I’d be off. I always knew that he was not allowed to leave his room while on duty. “I hope I didn’t cause any accidents at sea,” Mrs Dell said impishly.